Demonstrators march along Wellington’s Lambton Quay on their way to Parliament to present a petition against the government’s social housing policies in November 2012. 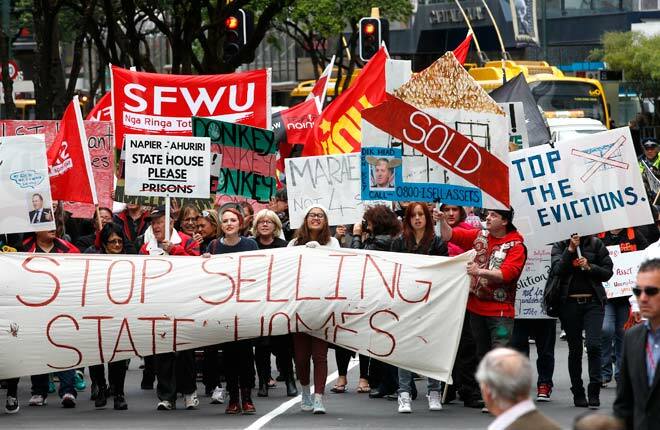 They were protesting government plans to redevelop traditional state housing areas such as Glen Innes (Auckland), Maraenui (Napier) and Pōmare (Lower Hutt) into a mixture of private and social housing. The protestors believed it would reduce the proportion of social houses and force state housing tenants to leave these areas.